Georges Clemenceau was born in Mouilleron-en-Pareds, France, on 28th September, 1841. His mother, Sophie Eucharie Gautreau (1817-1903) was from a Huguenot family. His father, Benjamin Clemenceau (1810-1897) was a supporter of the 1848 Revolution and this ensured he grew up with strong republican views. 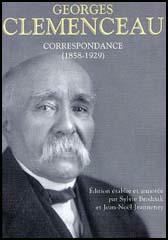 With a group of fellow students Clemenceau began publishing Le Travail. It was seized by the police and Clemenceau spent 73 days in prison. On his release he started a new journal, Le Matin, but this also got him into trouble with the authorities. After finishing his medical studies he went to live in New York. He was impressed by the political freedom enjoyed by the people of the United States and considered settling permanently in the country. He found work as a schoolteacher in Stamford, Connecticut and eventually married one of his former students. Clemenceau returned home in 1869 and established himself as a doctor in Vendée. When Germany defeated France in 1870 Clemenceau moved to Paris and once again became involved in radical politics. In February, 1871, Clemenceau was elected as a Radical Republican deputy in the National Assembly. He voted against the peace terms demanded by Germany and became involved in the insurrection known as the Paris Commune. After being re-elected to the National Assembly in 1876, Clemenceau emerged as the leader of the Radical-Republicans. 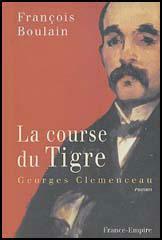 As a result of his aggressive debating style, Clemenceau was given the nickname, 'The Tiger'. In 1902 Clemenceau became a senator and four years later, at the age of 61, was appointed minister of home affairs. Now a right-wing nationalist, Clemenceau ruthlessly suppressed popular strikes and demonstrations. Seven months later Clemenceau became France's prime minister. His period in office (1907-10) was marked by his hostility to socialists and trade unionists. On the outbreak of the First World War Clemenceau refused office as justice minister under the French prime minister, Rene Viviani. As editor of L'Homme Libre, Clemenceau became an outspoken opponent of Joseph Joffre, chief of general staff in the French Army. Clemenceau also accused the interior minister, Louis Malvy, of being a pacifist when it became known that he favoured a negotiated peace. In November 1917 the French president, Raymond Poincare appointed Clemenceau as prime minister. He immediately clamped down on dissent and senior politicians calling for peace, such as Joseph Caillaux and Louis Malvy were arrested for treason. In a speech on 20th November 1917 Clemenceau said: "We promise you, we promise the country, that justice will be done according to the law. Weakness would be complicity. We will avoid weakness, as we will avoid violence. All the guilty before courts-martial. The soldier in the courtroom united with the soldier in battle. No more pacifist campaigns, no more German intrigues. Neither treason, nor semi-treason: the war. Nothing but the war. Our armies will not be caught between fire from two sides. Justice will be done. The country will know that it is defended." Clemenceau, who also became minister of war in the government, and played an important role in persuading the British to accept the appointment of Ferdinand Foch as supreme Allied commander. He also insisted that the exhausted French Army led the offensive against the German Army in the summer of 1918. At the Versailles Peace Conference Clemenceau clashed with Woodrow Wilson and David Lloyd George about how the defeated powers should be treated. Lloyd George told Clemenceau that his proposals were too harsh and would "plunge Germany and the greater part of Europe into Bolshevism." Clemenceau replied that Lloyd George's alternative proposals would lead to Bolshevism in France. At the end of the negotiations Clemenceau managed to restore Alsace-Lorraine to France but some of his other demands were resisted by the other delegates. Clemenceau, like most people in France, thought that Germany had been treated too leniently at Versailles. Clemenceau's failure to achieve all his demands resulted in him being rejected by the French electorate in January 1920. After retiring from politics Clemenceau wrote his memoirs, The Grandeur and Misery of Victory. In the book Clemenceau warned of further conflict with Germany and predicted that 1940 would be the year of the gravest danger. 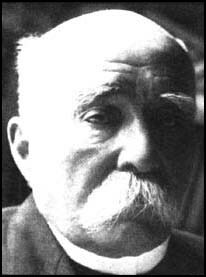 Georges Clemenceau died in Paris on 24th November, 1929. When I am told that we should live in peace with our neighbours, I agree, but let us not forget that it needs two to make peace. The great mistake of the revolutionary Socialists is to think themselves superior to the rest of mankind because they are not prepared to bend their ideology before the irreducible realities of human nature. The hour of grave resolutions has come: it is a question, for France, of life or death. There, on the other side of the Rhine, is a strong and great nation that has the right to live, but not to crush all independent life in Europe. Russia has the choice of suicide or resistance. Our case is no different. If Russia, standing alone, is beaten, it will only be a matter of time before France is despatched: then England's turn will come. (3) Lord Francis Bertie, the British Ambassador in Paris, wrote to the British government about the situation in France on 21st February 1917. Briand, though not popular in the Chamber, and though his conduct of affairs is much criticized there, manages to keep himself in office, partly by his Parliamentary skill and his persuasive eloquence, and owing to the non-existence of a suitable successor, and no combination of parties constituting a majority in the Chamber being able to agree on the choice of substitute. Clemenceau, who not very long since was thought of, has from his continual but unreasoning attacks in his newspaper on M. Briand and the authorities generally, and his recent defeat in the Senate, rendered himself impossible. Poincare made advances to him for a reconciliation but was unsuccessful. (4) Lord Francis Bertie, the British Ambassador in Paris, wrote to the British government about the situation in France on 14th November 1917. Thomas and his particular friends in the Socialist party are determined to wreck any ministry in which they do not have a representative, unless they can exercise a predominant influence in such a cabinet. They have vetoed a Clemenceau ministry, and a portion of the Radical Socialist party would be strongly opposed to such a ministry. There is, however, in the middle classes and the people generally, a strong feeling in his favour. He might soon be outvoted in the Chamber but I believe that in such event he might be capable of bringing a Corps d-Armee to Paris to maintain order, and that the people generally would welcome the momentary suppression of the violent Socialists. The Tiger (Clemenceau) arrives; he is fatter, and his deafness has increased. His intelligence is intact. But what about his health, and his will-power I fear that one or the other may have changed for the worse and I feel more and more the risk of this adventure. But he has all patriots on his side, and if I do not call on him his legendary strength would make any alternative cabinet weak. Mistakes have been made; do not think of them except to rectify them Alas, there have also been crimes, crimes against France which call for a prompt punishment. We promise you, we promise the country, that justice will be done according to the law. Weakness would be complicity. We will avoid weakness, as we will avoid violence. All the guilty before courts-martial. The soldier in the courtroom united with the soldier in battle. No more pacifist campaigns, no more German intrigues. Neither treason, nor semi-treason: the war. Nothing but the war. Our armies will not be caught between fire from two sides. Justice will be done. The country will know that it is defended. Within the council chamber his domineering manner, his brusqueness of speech, and his driving methods of conducting business disappeared. He showed patience and consideration towards his colleagues and seldom spoke until the others had expressed their views. It was only on rare occasions that he abandoned his suavity of address and allowed his emotions to affect his utterances. It was then only that one caught a glimpse of the ferocity of The Tiger. Today Clemenceau is angry with the English, and especially with Lloyd George. "I won't budge," he said, - I will act like a hedgehog and wait until they come to talk to me. I will yield nothing. We will see if they can manage without me. Lloyd George is a trickster. He has managed to turn me into a "Syrian". I don't like being double-crossed. Lloyd George has deceived me. He made me the finest promises, and now he breaks them. Fortunately, I think that at the moment we can count on American support. What is the worst of all is that the day before yesterday, Lloyd George said to me. "Well, now that we are going to disarm Germany, you no longer need the Rhine". I said to Clemenceau: "Does disarmament then seem to him to give the same guarantees? Does he think that, in the future, we can be sure of preventing Germany from rebuilding her army?" "We are in complete agreement," said Clemenceau; " it is a point I will not yield." In the last three days, we have worked well. All the great issues of concern to France are almost settled. Yesterday, as well as the two treaties giving us the military support of Britain and the United States in case of a German attack, I obtained the occupation of the Rhineland for fifteen years, with partial evacuation after five years. If Germany does not fulfil the treaty, there will be no evacuation either partial or definitive. At last I am no longer anxious. I have obtained almost everything I wanted. There never was a greater contrast, mental or spiritual, than that which existed between these two notable men. Wilson with his high but narrow brow, his fine head with its elevated crown and his dreamy but untrustful eye - the make-up of the idealist who is also something of an egoist; Clemenceau, with a powerful head and the square brow of the logician - the head conspicuously flat topped, with no upper storey in which to lodge the humanities, the ever vigilant and fierce eye of the animal who has hunted and been hunted all his life. The idealist amused him so long as he did not insist on incorporating his dreams in a Treaty which Clemenceau had to sign. It was part of the real joy of these Conferences to observe Clemenceau's attitude towards Wilson during the first five weeks of the Conference. He listened with eyes and ears lest Wilson should by a phrase commit the Conference to some proposition which weakened the settlement from the French standpoint. If Wilson ended his allocution without doing any perceptible harm, Clemenceau's stern face temporarily relaxed, and he expressed his relief with a deep sigh. But if the President took a flight beyond the azure main, as he was occasionally inclined to do without regard to relevance, Clemenceau would open his great eyes in twinkling wonder, and turn them on me as much as to say: "Here he is off again!" In the view of the Allied and Associated Powers the war which began on August 1st, 1914, was the greatest crime against humanity and the freedom of peoples that any nation, calling itself civilised, has ever consciously committed. For many years the rulers of Germany, true to the Prussian tradition, strove for a position of dominance in Europe. They were not satisfied with that growing prosperity and influence to which Germany was entitled, and which all other nations were willing to accord her, in the society of free and equal peoples. They required that they should be able to dictate and tyrannise to a subservient Europe, as they dictated and tyrannised over a subservient Germany. Germany's responsibility, however, is not confined to having planned and started the war. She is no less responsible for the savage and inhuman manner in which it was conducted. Though Germany was herself a guarantor of Belgium, the rulers of Germany violated, after a solemn promise to respect it, the neutrality of this unoffending people. Not content with this, they deliberately carried out a series of promiscuous shootings and burnings with the sole object of terrifying the inhabitants into submission by the very frightfulness of their action. They were the first to use poisonous gas, notwithstanding the appalling suffering it entailed. They began the bombing and long distance shelling of towns for no military object, but solely for the purpose of reducing the morale of their opponents by striking at their women and children. They commenced the submarine campaign with its piratical challenge to international law, and its destruction of great numbers of innocent passengers and sailors, in mid ocean, far from succour, at the mercy of the winds and the waves, and the yet more ruthless submarine crews. They drove thousands of men and women and children with brutal savagery into slavery in foreign lands. They allowed barbarities to be practised against their prisoners of war from which the most uncivilised people would have recoiled. The conduct of Germany is almost unexampled in human history. The terrible responsibility which lies at her doors can be seen in the fact that not less than seven million dead lie buried in Europe, while more than twenty million others carry upon them the evidence of wounds and sufferings, because Germany saw fit to gratify her lust for tyranny by resort to war. The Allied and Associated Powers believe that they will be false to those who have given their all to save the freedom of the world if they consent to treat this war on any other basis than as a crime against humanity. Justice, therefore, is the only possible basis for the settlement of the accounts of this terrible war. Justice is what the German Delegation asks for and says that Germany had been promised. Justice is what Germany shall have. But it must be justice for all. There must be justice for the dead and wounded and for those who have been orphaned and bereaved that Europe might be freed from Prussian despotism. There must be justice for the peoples who now stagger under war debts which exceed £30,000,000,000 that liberty might be saved. There must be justice for those millions whose homes and land, ships and property German savagery has spoliated and destroyed. That is why the Allied and Associated Powers have insisted as a cardinal feature of the Treaty that Germany must undertake to make reparation to the very uttermost of her power; for reparation for wrongs inflicted is of the essence of justice. That is why they insist that those individuals who are most clearly responsible for German aggression and for those acts of barbarism and inhumanity which have disgraced the German conduct of the war, must be handed over to a justice which has not been meted out to them at home. That, too, is why Germany must submit for a few years to certain special disabilities and arrangements. Germany has ruined the industries, the mines and the machinery of neighbouring countries, not during battle, but with the deliberate and calculated purpose of enabling her industries to seize their markets before their industries could recover from the devastation thus wantonly inflicted upon them. Germany has despoiled her neighbours of everything she could make use of or carry away. Germany has destroyed the shipping of all nations on the high sea, where there was no chance of rescue for their passengers and crews. It is only justice that restitution should be made and that these wronged peoples should be safeguarded for a time from the competition of a nation whose industries are intact and have even been fortified by machinery stolen from occupied territories. On the afternoon of the third day of the private meetings of the premiers two French newspaper men came in to the American press room at the Hotel Crillon. There were only a few American correspondents there. It was teatime, as the Frenchmen remarked in some surprise, and no tea; they did not know that tea is an English, not an American, institution. We were working when they marched in like a couple of gendarmes, but I rose to meet them, and others came up to make them welcome. They were polite for a few moments; then they said that they had come to verify a bit of news. Had we heard of a little scene at the meeting of the president and the premiers? We looked at one another, we Americans, and I said, "No, nothing. Why? What had they heard?" They exchanged glances, and one of them spoke for them both. "We heard - but only from French sources, and we can't use it unless we get American confirmation of it - we heard that M. Clemenceau challenged M. Wilson to make a permanent peace. Have you heard anything about the scene?" "No," I said for myself, and the other Americans present nodded no. "Tell us about it," I urged. "Describe the scene." Then one of them told how, when the president and the premiers sat down at the table that morning and were about to proceed to business, M. Clemenceau, who was fiddling with his gray silk gloves, said, "One moment, gentlemen. I desire before we go any further to be made clear on one very essential point." The French reporter was entering into his story; he mimicked Clemenceau, drawing tight and smooth his little silk gloves, and bowing sweetly and smiling sardonically. And the reporter acted the parts he quoted. The president and the premiers halted and looked up expectantly at M. Clemenceau, who said: "I have heard something about a permanent peace. There has been a great deal of talk about a peace to end war forever, and I am interested in that. All Frenchmen would like to make permanent peace. But I would like to know-all the French would like to know-whether you mean it, the permanent peace." He looked at his colleagues and they nodded. "So," Clemenceau said, "you really mean it! Well, it is possible. We can do it; we can make the permanent peace. And we French need, we very much need, the permanent peace. Every time you, our neighbors, get into a fight, France is the battlefield, and our population, our armies, do not increase. If there is not an end of wars we French may be all wiped out some day. So, you see, it is we French more than you remote Americans, Mr. President, more than you safe islanders, Mr. Lloyd George, who require the security of the real peace. But we French cannot quite believe that you, our friends, neighbors, allies-that you really mean what you say. Do you, Mr. President?" And the Italians did, of a certainty, yes. "Very important," M. Clemenceau muttered, as if convinced, as if the whole prospect were changing, and his whole policy. "Very important. We can make this a permanent peace; we can remove all the causes of war and set up no new causes of war. It is very, very important what you say, what you have been so long saying, Mr. President. We here now have the opportunity to make a peace that shall last forever, and the French people, diminishing, will be safe. And you are sure you propose to seize this opportunity?"